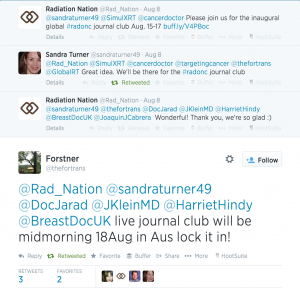 #radonc Journal Club: Global Learning on Twitter - RadOnc Community! 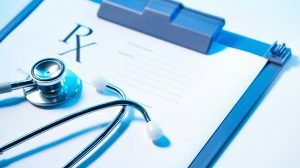 Twitter-based health chats can be a very rewarding way to learn and interact with others that care about similar topics. Radiation oncology is a longstanding cornerstone of cancer care, and it’s exciting to participate in bringing online learning to people globally via #radonc starting as a journal club. you can share more about radiation oncology with people outside the field. social media coverage may correlate to more traditional measures of academic impact. Twitter has been used effectively for radiology (#JACR) and urology (#urojc) learning. With the help and guidance of Dr. Henry Woo, we are now ready to do the same for radiation oncology. We are building on the successful model of #urojc, which recently reported a positive first year’s experience as a monthly journal club. We have chosen to try to fuse an open 48 hour free chat (asynchronous) with a vibrant, one-hour live chat similar to #hcldr, #hcsm, #meded and other very successful Twitter communities. Please let us know ways in which we can improve the model to work for the radiation oncology community, as it’s likely to differ from other specialties in some key ways. We’re prepared to adapt further, but first let’s try this model. Once the chat is complete, we’ll aggregate into a transcript using Symplur, which organizes hashtags and give analytics and transcripts. Any other suggestions on how best to share would be greatly appreciated so that the information may be shared with others who can’t participate. Similar to #urojc, we plan on recognizing participants as leaders. None of the organizers can win prizes; we want to recognize your contributions to learning and awareness of radiation oncology’s importance to cancer care. Do keep in mind that Twitter is public domain. We do have some suggested guidelines on participation. Here are some tips on getting started on social media, using Twitter, and for tweet chats. If in doubt, lurk and listen. But when you’re ready, speak up – we look forward to learning from you!